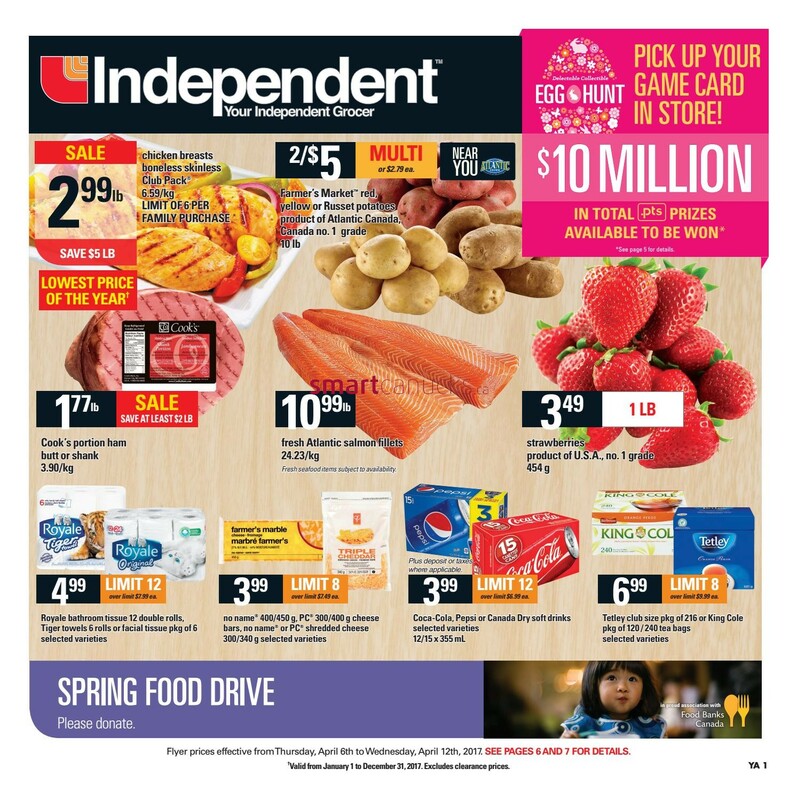 Independent Your Independent Grocer. EGG Hunt Pick up your game card in store! $10 Million in total .pts prizes available to be won. 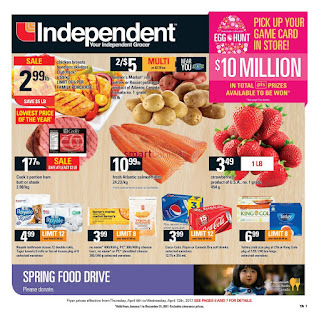 New grocery store offers from the Independent Grocer, including Chicken, Fresh Atlantic Salmon, Strawberries Russet Potatoes on the cover page and impressive new pricing and price guarantee. No Name 400/450 g, PC 300/400g cheese bars, no name or PC chredded cheese 300/340g selected varieties price 3.99 limit 8. 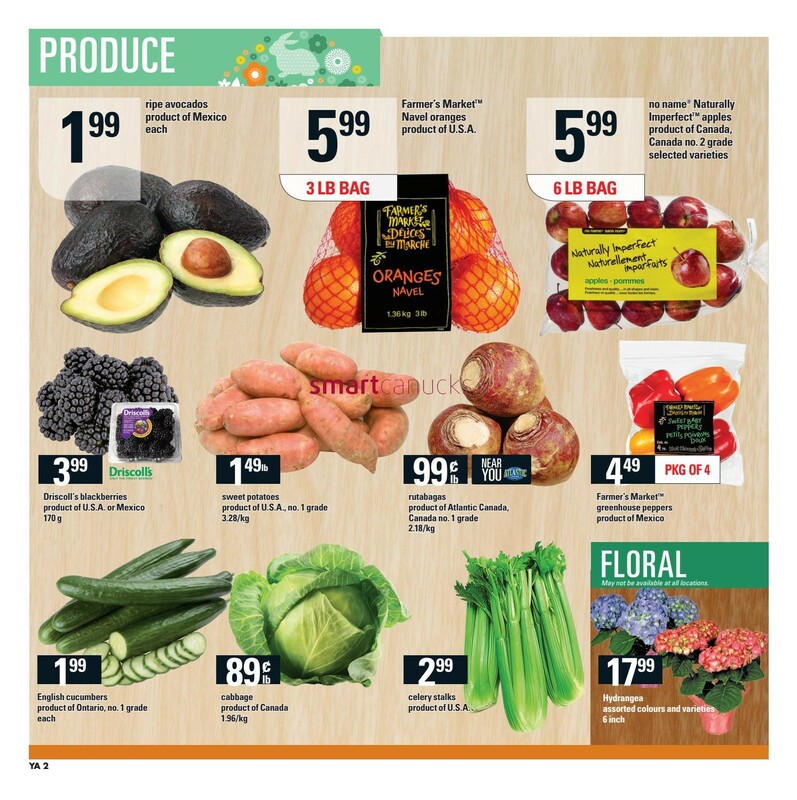 Ripe avocados product of Mexico price 1.99 each, Farmers Market Navel oranges product of U.S.A price $5.99 3 LB Bag, No name Naturally Imperfect Apples product of Canada no.2 Grade selected varieties price 5.99 6 lb Bag, Driscoll's blackberries product of U.S.A or Mexico price $3.99, Sweet potatoes product of U.S.A no1 grade price 1.49 lb, Rutabagas Product of Atlantic Canada grade #1 2.18/kg price 99 c lb, Farmer's Market Greenhouse peppers product of Mexico price 4.49, English cucumbers product of Ontario, Grade #1 price 1.99 each, Cabbage product of Canada 1.96/kg price 89 lb, Celery stalks price price $2.99.